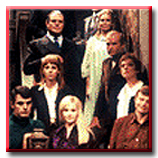 Even with the core cast playing multiple roles, from time to time the Dark Shadows scripts called for short-term characters to advance the storyline. A lot of the DS dayplayers were either at the twilight of long stage, movie, or TV careers or they went on to win major acting awards or became fixtures on classic TV shows. Click here to read features about some of these temporary residents of Collinsport. Learn more about the lives and careers of your favorite cast members. Check out some fun DS cast pictures from the collection of DSO's webmaster, including rare shots from newspaper clippings and from some cast members' personal collections.SEE THE PICS. In 1968, Lara Parker garnered great reviews as a young Mormon bride in Woman is My Idea. 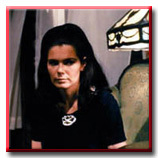 Clarice Blackburn Played a Murderess With "Edith Bunker"
In 1953, Clarice Blackburn starred Off-Broadway in American Gothic, alongside Jason Robards Jr. and Jean Stapleton (later Edith Bunker on the TV classic All in the Family). READ MORE. Nancy and Sally (Gloria from All in the Family) were among the performers entertaining the members of a retirement home in New York. See exclusive photos and READ MORE. Read some of the trivia that ended up on the "cutting room floor" as Craig Hamrick wrote his new book, Barnabas and Company. READ MORE. See if you can identify several DS stars from their childhood photos. Most have been given to Dark Shadows Online by the actors themselves. READ MORE. Denied the chance to wear fangs on Dark Shadows, Chris Bernau became Count Dracula in an off-Broadway play called The Passion of Dracula, which opened in September 1977. READ MORE. The officially licensed Dark Shadows collectibles include Barnabas boxer shorts, a paperback series, comic books, a Halloween costume, a View-Master set, and more. And most of them feature photos of many fan-favorites, like Lara Parker, David Selby, Louis Edmonds, Alexandra Moltke, of course Jonathan Frid, and many others. Since Dark Shadows Online's webmaster has written two books about these collectibles, this site includes a big section devoted to them. READ MORE. 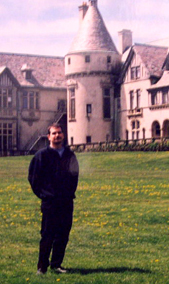 In May 1999, actress Nancy Barrett visited Seaview Terrace, the house which was used as the exterior of the haunted mansion Collinwood on Dark Shadows . Nancy portrayed Carolyn Stoddard on the show. Featuring exclusive PHOTOS! READ MORE. Nancy Barrett discusses working with Louis "Big Lou" Edmonds. READ MORE. A brief interview with Alexandra Moltke. READ MORE. In 1983, one of All My Children's biggest fans asked the show's producer if she could be written in to the story line briefly. The role that was written especially for her was Verla Grubb, illegitimate daughter of Langley Wallingford (played by DS alum Louis Edmonds). The fan was a legendary actress from television, film and, Broadway: Carol Burnett. READ MORE. Six years before he played dour Roger Collins on Dark Shadows, Louis Edmonds happily dashed about a Greenwich Village stage in a pink bow tie, singing and dancing as Algernon in a hit off-Broadway musical adaptation of Oscar Wilde's The Importance of Being Earnest called Ernest in Love. READ MORE. 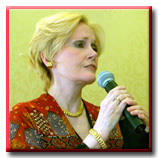 Nancy Barrett performed a one-woman show titled "Once Again," at the MGM Grand Hotel in Las Vegas on July 12 as part of the 1998 Dark Shadows Festival. READ MORE. "Each year, more than 100,000 Americans are told they have colon cancer, the second deadliest form of the disease. In 2002, a few days after my thirty-sixth birthday, I became one of those people." Please visit the Colon Cancer Alliance website to learn if you could be at risk -- and what you can do.